Brimful Curiosities: My Poetry Book Kids' Poetry Challenge - Week 2 - "Rabbit"
My Poetry Book Kids' Poetry Challenge - Week 2 - "Rabbit"
Welcome to the second of five "My Poetry Book" Kids' Poetry Challenge post link-ups! In celebration of National Poetry month, we're challenging other parents and kids to explore the world of poetry together. Each week in April we hope you'll consider reading a poem with your child and then encourage your child to create an illustration based on the poem. This type of creative activity helps your child more thoroughly understand the poem and interpret it in his or her own way. 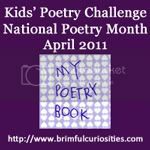 If you would like to participate, please refer the original Kids' Poetry Challenge post and read the guidelines. 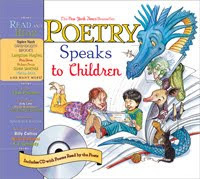 Last year during National Poetry Month I learned of a wonderful anthology for children called Poetry Speaks to Children . The book includes a nice variety of 95 poems from 73 poets, many familiar along with some not as well-known. The layout is attractive and only one or two poems appear on each page. Nearly all the poems are illustrated. Because of the vast array of poems featured and the lovely layout, this book appeals to a wide audience range, from preschoolers to older kids to adults. What makes this book particularly wonderful though is the accompanying CD that includes 52 of the poems from the book. Most of the poems on the CD are read by the poets themselves. The poetry actually speaks! Of all the poems in the book, my daughter likes Mary Ann Hoberman's "Rabbit" the best. Perhaps she likes it best because she can read it herself (certainly not because of the beet). Hoberman often plays with words in her poems and pays much attention to the arrangement of the words and the shape of the poem. With "Rabbit" Hoberman puts all the "bits" in a line. 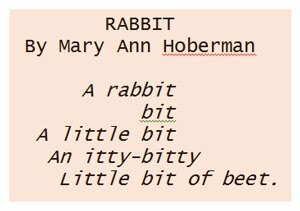 The same rabbit poem also appears in another of our favorite poetry books, The Llama Who Had No Pajama: 100 Favorite Poems by Mary Ann Hoberman, illustrated by Betty Fraser. The full text of "Rabbit" can be viewed in a book preview at Google Books. I'm linking up to Poetry Friday! This week's Poetry Friday is hosted by Madigan Reads. Head over to her blog for more poetry posts and consider joining the Poetry Friday link-up. Love this idea of a poetry book! I'm going to have to try this so I can start linking up! Thanks for visiting my blog, I hope you'll come back soon! Poetry Speaks to Children looks like a great book! I'll have to look into acquiring that one for our collection. That Mary Ann Hoberman poem is GREAT! I love your dd's picture, too. Thanks so much for hosting this, Janelle. We're having a good time with the artwork! We had the book, but I quickly found that most of the poems are a bit beyond my daughter's age. We love Bill Martin's Big Book of Poetry that is also wonderfully illustrated. I love your daughter's drawing! @Raising a Happy Child - This is a book kids can grow into. There are only a few poems that might interest preschoolers, but for those that have kids that vary in age, this is a very good choice for the home library. I read about 1/4 of the poems in the book to my kindergarten aged daughter. The rest we'll save until she is older. My youngest has one of these too! I love what they do with the children these days. 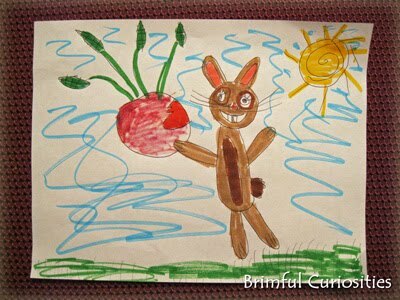 That is the cutest rabbit drawing. I'll have to see if I can interest my little ones in participating. They love reading, poetry included, so it shouldn't be too hard! I love your daughter's picture...so cute! Thanks for the book suggestion. I'll have to look for that one. Love it! My daughter has been very into poetry lately. I will check these out!